The city of Calgary, in Canada, has a new green heart thanks to the revitalisation of the historical park on St. Patrick’s Island, in the Bow river. The project by the urban designers and landscape architects of the Denver-based Civitas studio, in collaboration with W Architecture and Landscape Architecture of New York and Toronto’s IBI group, offers a new urban experience. A town does not only need to be provided with green areas: on the contrary, these need to be actually used by citizens, so that they may enjoy and benefit from them. To provide you with an example of revitalisation of an existing park, today we will take you to Calgary, in the Canadian state of Alberta. Here, the 12-hectare St. Patrick’s Island, in the middle of the Bow river, used to be a historical crossing for buffalo and aboriginal people. This interaction with the river came to an end as time passed but, thanks to the intervention of the Civitas/W team, it was restored: indeed, only by interacting with the river citizens can understand its dynamics and its importance for the city. This way, the new St. Patrick’s Island was designed as a model of resiliency and sustainability, drawing on the island’s natural history to restore its biodiversity and providing new amenities to engage visitors during both summer and winter months. The heart of the island and of the landscaping intervention is the realisation of four different habitats, especially a wetland area in the central part of St. Patrick’s Island. “The Lowland Channel” is the perfect habitat for native songbirds, much loved by bird-watchers, and helps reduce the flood risk naturally. The earth excavated for this intervention was used to create a real landmark: “The Rise” is a 10-meter-high grassy knoll offering great views, enabling people living in the nearby East Village to see the activities on the island, and encouraging them to cross the new bridge, on foot or riding their bike to enjoy the park, its trails, bike paths, and many playgrounds. The St. Patrick’s Island Park project by Civitas/W faces in a very smart way important environmental issues, considering that the resilience of the areas close to rivers and the sustainable ability to withstand floods are becoming more and more fundamental topics in our world of today, that is affected by the climate change. At the same time, the project also offers to the citizens spaces to explore and live actively. This active involvement allows citizens to be more aware of the environment and its issues. 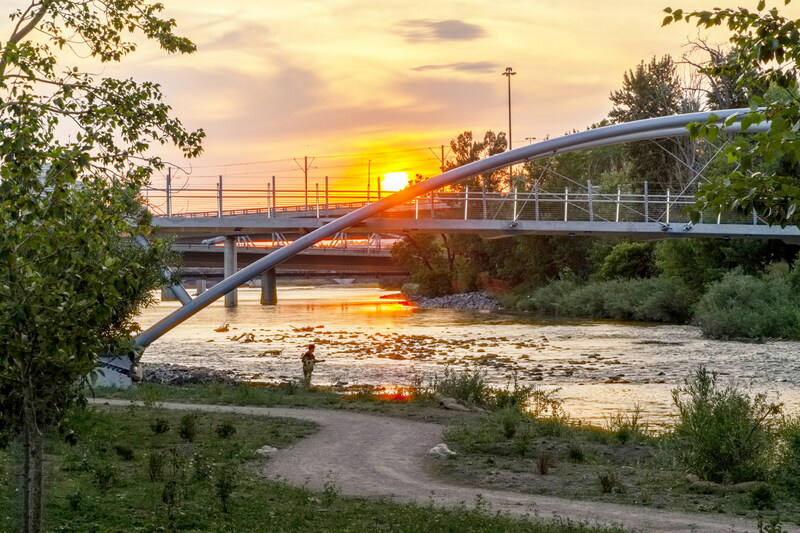 The St. Patrick’s Island Park opened in 2015 and received several awards: in 2016, it was named Great Public Space by the Canadian Institute of Planners and was honoured with a 2016 Excellence on the Waterfront Award from the non-profit Waterfront Center, while in 2017 it received the International Architecture Award from the Chicago Athenaeum Museum of Architecture and Design/European Centre for Architecture Art Design and Urban Studies.